Identifying the physical mechanism of coherent light generation, essential to cutting-edge science. Increased impedance near cut-off in plasma-like media leading to emission of high-power, narrow-bandwidth radiation by M. S. Hur, B. Ersfeld, A. Noble, H. Suk & D. A. Jaroszynski published in Nature Scientific Reports on the 10th January 2017. Coherent light sources such as lasers have many uses, from communication to probing the structure of matter. The simplest source of coherent electromagnetic radiation is an oscillating electric current in an antenna. However, there are many other devices are based on these basic laws of physics, such as the free-electron laser, which produces coherent X-ray radiation, or magnetrons found in microwave ovens that heat your food. Modern light, or, more generally, electromagnetic, sources used as scientific tools require good coherency, monochromaticity, and high emission power. Coherency and narrow bandwidth (monochromaticity) are important properties of electromagnetic radiation that allow it to be used to observe changes in the structure of materials subject to stimuli, such as a short intense laser pulse; material properties are deduced from changes that are made apparent in pump-probe studies. The best analogy here is making a movie by assembling many time lapse snap-shots to animate the changes that are occurring in the material after it has been stimulated. This is a very powerful tool for scientists that enables them to understand the intricacies of how materials or even biological molecules behave under different conditions, which has a huge impact on people’s lives through the development of new products and medical treatments etc. The main challenge is how to make high power sources of electromagnetic radiation monochromatic. This is often done by making the oscillating current narrowband bandwidth or filtering the spectrum, which is extremely inefficient. It is very expensive or complicated to reduce the bandwidth of a current source while maintaining or increasing its radiated power. There is normally a direct correspondence between the bandwidth of the oscillating current source and the bandwidth of the radiation emitted. Scientists at UNIST and GIST in Korea have collaborated with scientists at Strathclyde University in the new research that shows that this normal direct correspondence between the bandwidths of the current source and emitted radiation can be broken. Their work, published in Nature Scientific Reports, has found that narrowband radiation can be extracted with high efficiency without making the current oscillation narrowband. This is a remarkably simple idea based on straightforward physics theory that seems to have been overlooked. The UNIST, GIST and Strathclyde scientist have shown that some common media with interesting optical properties can be taken advantage of if we imbed (bury) an oscillating current source in them. Media such as plasma, semiconductors and photonic structures have a ‘cut-off’, which is a well-known property of a class of dispersive media, where propagation of electromagnetic radiation with frequencies lower than the ‘cut-off’ frequency is prohibited. The authors noticed that the radiation impedance is increased at the cut-off. One consequence of this is that for a broadband current source immersed in this type of dispersive medium, the cut-off frequency “mode” is selectively enhanced due to Ohm’s law, resulting in narrow bandwidth emission. What is curious is that novel physics should still be hidden in the classical cut-off behaviour. 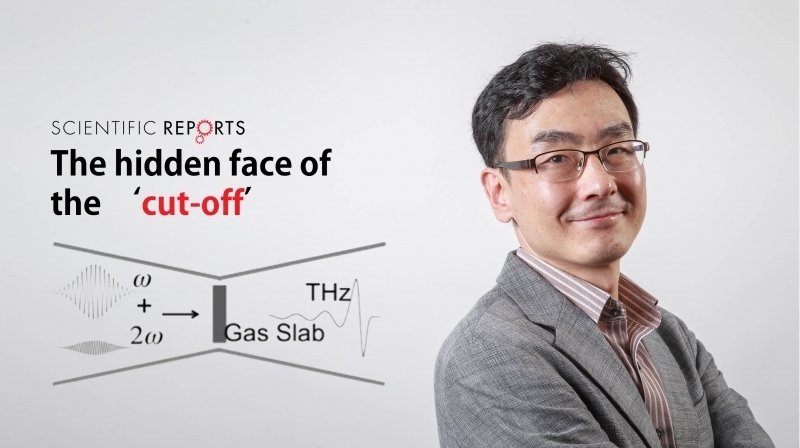 In this new research, the authors have uncovered a hidden face of the cut-off, and realised a new paradigm of narrowband light sources in media that would not usually allow electromagnetic radiation to propagate. Professor Dino Jaroszynski at the University of Strathclyde who leads the work from Strathclyde says “This is a very exciting theoretical discovery that comes out of a very fruitful cross-continental collaboration. It shows that we should always keep an open mind and question even very basic assumptions. We hope to demonstrate this phenomenon at the Scottish Centre for the Application of Plasma-based Accelerators. There are numerous applications of electromagnetic radiation. The proposed source should have a large impact if we are able to demonstrate it experimentally. This study has been supported by the National Research Foundation (NRF) of Korea funded by the Korean Government (MSIP). M. S. Hur, B. Ersfeld, A. Noble, H. Suk, and D. A. Jaroszynski, “Increased impedance near cut-off in plasma-like media leading to emission of high-power, narrow-bandwidth radiation”, Scientific Reports 7, (2017).